Formulations made before 1978 may contain white asbestos fibers. 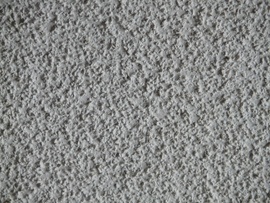 If installation of the popcorn ceiling took place before 1978, a small section is tested for asbestos ($50 to $100). The average cost of removing popcorn ceiling from a 10’x10’ area is $100 to $300. Most professionals charge $1 to $3 per square foot (including the cost of materials) depending on the room size, quality/age of the popcorn ceiling, and whether or not there is paint and/or asbestos.